Upper and lower extremity injuries are common in children, with an overall risk of fracture estimated at just under 1 in 5 children. 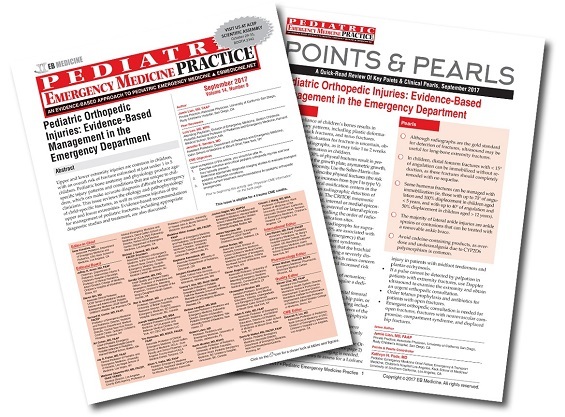 Pediatric bone anatomy and physiology produce age-specific injury patterns and conditions that are unique to children, which can make accurate diagnosis difficult for emergency clinicians. 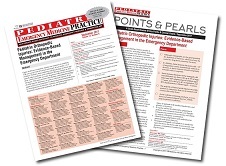 This issue reviews the etiology and pathophysiology of child-specific fractures, as well as common injuries of the upper and lower extremities. Evidence-based recommendations for management of pediatric fractures, including appropriate diagnostic studies and treatment, are also discussed. A 12-year-old obese boy presents with 1 week of progressively worsening right hip pain. He has no fever or history of trauma. He went to his primary care physician earlier in the week and was diagnosed with a hip strain, but his pain has continued to worsen. He is now unable to bear weight on the right leg. Physical examination reveals a well-appearing boy with no tenderness to palpation about the hip joint, femur, or knee, but markedly decreased internal rotation of the right hip. Neurovascular examination of the right lower extremity is normal. You wonder: What is the most likely cause of this child’s pain? What laboratory or imaging studies will be most useful for diagnosis and management? Should this child be allowed to continue bearing weight? Does he need an urgent orthopedic consultation? A 3-year-old girl presents after a fall onto her outstretched left hand. She is using the left arm much less than usual. Physical examination reveals minimal swelling at the elbow. She flinches with palpation over any part of the elbow, but has no tenderness over the distal forearm or shoulder. She can move her thumb and fingers spontaneously. Radiographs of the left elbow show no fracture. You wonder if this girl could possibly have a nursemaid’s elbow. Should you be looking for something else on these radiographs? Do you need to get additional radiographs? This was a great article. I will review the EVB practice guidelines listed. I will use these practical guidelines for fracture assessment and management.